Finishing your education and moving on into the adult world is a momentous occasion for every student. Some even look back at their last year of school as the best time of their lives1. The final year of school in every country comes with many ceremonies and traditions, and in Canada one of those traditions is to celebrate the supremacy of your graduating class over all others by spray painting your “grad” year over anything and everything. No matter how big or small your town is, every year people must apparently be made aware that there are other people there who are graduating. 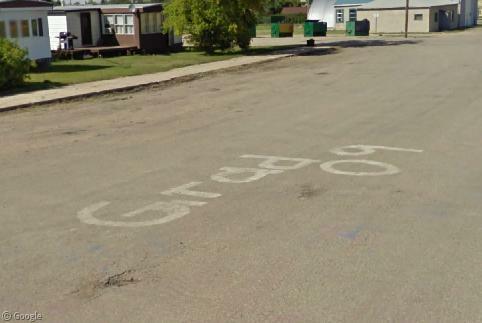 For example, one wonders if the residents of Major, Saskatchewan (most recent census population: 67) would have been aware of such a momentous occasion in 2009 if it hadn’t have been painted on the pavement of the main street? 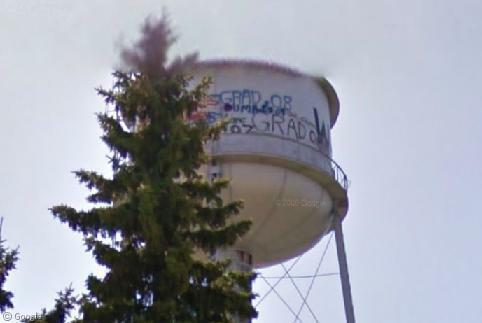 Often, graffiti battles between different classes break out, such as on this water tower in Wilkie, Saskatchewan. Apparently prized for both its prominent visibility and the difficulty of getting to the top, we can see a turf war has broken out amongst the classes of 2007, 2008, and 2009. One class has even resorted to calling the ’09 grads “dumb”; presumably this brilliant quip was the knockout blow. The natural environment for grad tags is the vaunted overpass, where thousands of vehicles each day can be reminded about graduation time. 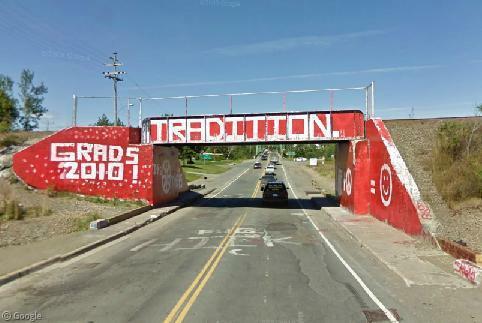 Some classes invest more time than others; rather than just spray paint on the side, each year this overpass in Sydney River, Nova Scotia is repainted in full with a new design by students from Riverview High School in neighbouring Coxheath. You don’t have to live near a high school to find grad tags in Canada. Even along the most remote stretches of highway, one can find messages displayed in high-visibility areas for travellers to see. 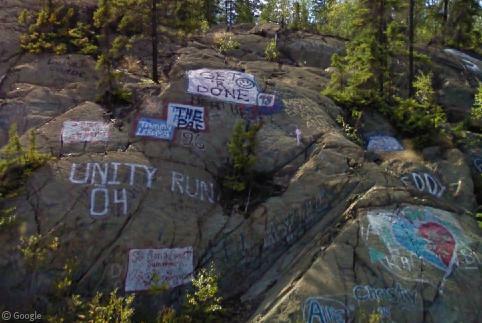 Deep in the northern Rocky Mountains, Pine Pass is an hour from the nearest school and even still is covered with graffiti of all sorts, such as this message from Grad ’04. 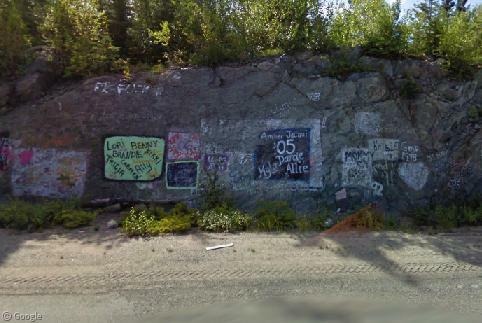 One of the densest accumulations of grad tags may be a stretch of Highway 10 just outside of Flin Flon, Manitoba. Flin Flon lies on the thinly-soiled Canadian Shield, which means many highways in the region are incised directly into the bedrock. 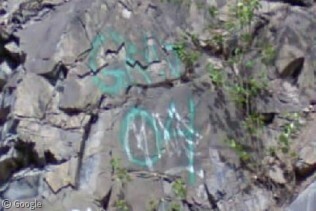 The open rock cuts are ripe for graffiti, and the highway leading south out of Flin Flon is filled with names and messages from various graduating classes dating back decades. 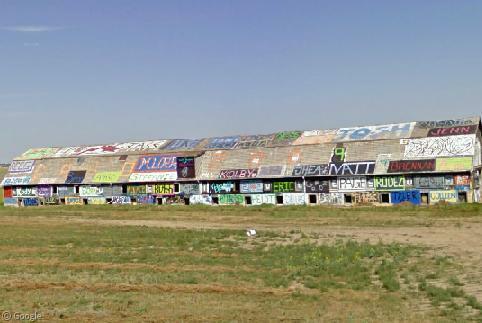 The ultimate grad tag paradise, however, may be the colourful Kerrobert Graffiti Barn in western Saskatchewan, where every year since 1977 the grad class of Kerrobert Composite School have taken over an entire barn at the north entrance to town and given each student their own slice of the edifice. What the… hey, Ken, quit hogging all the attention! 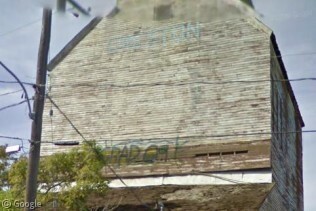 This barn was supposed to be for Grad ’09, not Grad ‘41!